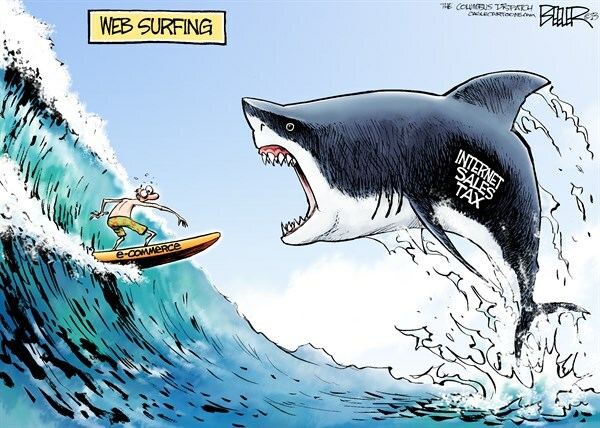 If you love to pay taxes then you’ll be happy to hear that a bipartisan group of Senators has introduced the Marketplace Fairness Act of 2015, a resurrected bill that would allow states to force businesses outside their borders to collect internet sales taxes for them. Under current law, online retailers are not required to collect sales taxes on any sales made to out of state consumers. This means that some of your online purchases are tax free. State governments, naturally, are not okay with losing out on this potential revenue. The Marketplace Fairness Act would change this by allowing states to compel out of state eCommerce companies to collect and remit sales taxes on all online sales. For example, if a Colorado resident orders a product online from a Texas company, the state of Colorado could force that company to collect and remit Colorado sales taxes on the purchase. In order to comply with the Act, online companies will have to become familiar with all of the different rules featured in each sales tax jurisdiction. As of last year a staggering 9,998 separate jurisdictions existed in the United States. Several versions of the Marketplace Fairness Act have been introduced in Congress, the most recent having been passed by the Senate in 2013. It failed to become law because Speaker of the House John Boehner kept it from coming up for a vote on the House floor. As the Act comes back from the dead, proponents are disguising their attempt to impose protectionist policies against online retailers as a benevolent desire to make life fairer for brick-and-mortar stores. But the Act is unfair in and of itself. For example, sales taxes are meant to be paid by the people of local communities and states since they directly receive the benefits funded by those taxes, such as roads or public golf courses. But the Marketplace Fairness Act would compel out of state businesses to collect for those projects, even though the companies never even use them.